The jungle is in India and, as The Jungle Book is a family film, it’s curiously non-threatening. It’s green and peaceful and… well… Disneyesque. Brightly coloured birds sing in the trees, while anally-retentive porcupines stress over what’s theirs. Sure, there are seductively hypnotic snakes who whisper silky promises in your ear as they slyly wind themselves around you, but you have to visit parts of the jungle that the sun doesn’t reach to find them. And that’s far from the region in which man-cub Mowgli (Neel Sethi) leads a carefree existence with the adoptive wolf pack in whose care he was placed by the friendly panther, Bagheera (Ben Kingsley – Ender’s Game, Stonehearst Asylum) years before. Bagheera came upon Mowgli wandering around the jungle after the man-eating tiger Shere Khan (Idris Elba – Beasts of No Nation, Zootopia) slayed the boy’s father, although not before the man was able to spear the tiger’s now disfigured face with the flame from his torch. Shere Khan hasn’t forgotten the boy, though – he’s the one who chased Mowgli to the jungle’s dark side. The humour in Jon Favreau’s 2016 update of the old Disney classic is underlined by a more sombre tone than that found in the original. Bad guys like Shere Khan – and later, the monkeys who abduct Mowgli on the orders of King Louie – are far more menacing. Things lighten up eventually, though, once the wily old bear Baloo (Bill Murray – Zombieland, Moonrise Kingdom) stamps his personality on the film. After rescuing Mowgli from the mesmerising grasp of the evil snake Kaa (Scarlett Johansson – The Prestige, Captain America: The Winter Soldier), Baloo has the boy braving angry bees in order to dislodge giant honeycombs hanging from a precipice as part-payment for what might have become a long-term debt had Bagheera not shown up to return Mowgli to his own people – much to the boy’s disgust. Mowgli’s undergone something of a change since the 1960s. Gone is the helpless innocent, unaware of the dangers that surrounded him. The 2016 version is still an innocent, but he’s not so helpless anymore; he recognises danger when it arises, and reacts accordingly. He’s also willing to stick up for himself – even if it usually doesn’t do him any good. Physically, the likeable Sethi closely resembles his cartoon predecessor and the way in which he mimics the original Mowgli’s loose-limbed movements is uncanny. But he also brings a refreshingly spunky personality to the part that adds a new dimension to the character. Sethi does a remarkable job, considering that, for his first major role, he must have been acting almost exclusively with models and stand-ins against a green screen. As you’d expect, the joins are flawless, the interaction seamless. Not once are we reminded that the animals and jungle scenery on the screen are nothing more than images created by a computer (although it’s a live-action movie, in a way 2016’s The Jungle Book is as much an animation as the 1967 version). 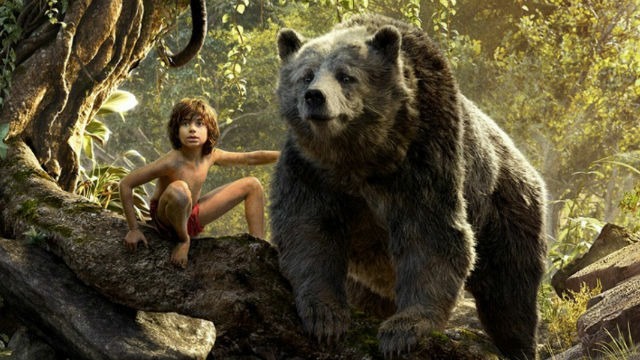 Too often these days, computer generated effects add little or nothing to a movie, and feel as if they’ve been added simply because they can be, but The Jungle Book simply wouldn’t have been feasible without the technology that exists today. Thankfully, the heart and spirit of Kipling’s stories remains despite the use of all that high tech trickery.